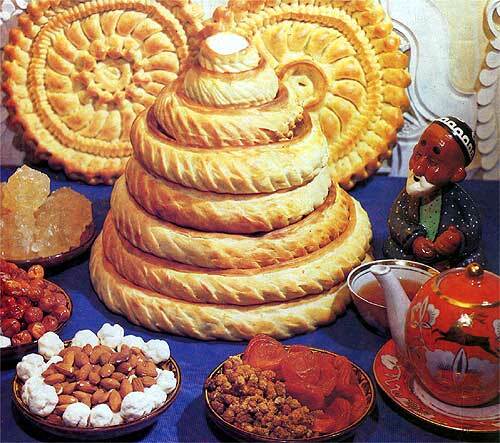 The splendid variety of pastries known as lepyoshkas (round breads) play a prominent part in Uzbek cuisine. Lepyoshkas are mentioned in one of the world's oldest written works, "Eros about Gylgamesh", the legendary ruler of the Sumerians, who lived almost 5000 years ago. Lepyoshkas are baked in special clay ovens called tandir. While unearthing the Afrosiab archaeological site in Samarkand, finds included tandirs used by worshippers. Tandirs are hand - built. They take the form of a cylinder with a narrow spout and two-centimeter thick walls made from mountain soil and camel or sheep hair. A finished tandir has to dry under the sun for a week. Sometimes big clay pitchers for wine, oil or grain are also used as tandirs. Tandirs are made in the yard under the awning and near the wall; the base of a tandir needs to touch the wall. A tandir's opening is 1.5 m off the floor, just opposite the baker's workplace. One more detail - the inner wall of a finished tandir is then oiled to smooth the walls and prevent the clay from sticking to the bread. Before each baking cycle, dried brushwood, finely chopped firewood from deciduous plants, is burned in the tandir. 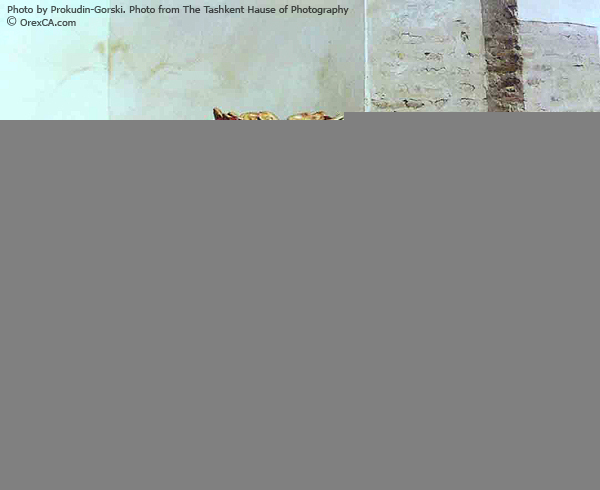 Firewood is gradually added until the walls of the tandir become red-hot, The coals and ashes are scraped towards the center and the walls are splashed with salt water to facilitate the separation of the bread from the clay wall. To put lepyoshkas into the fiery tandir, bakers use a rapida, a round lepyoshka-shaped cotton pillow. The raw shaped dough is placed on the rapida and carefully but swiftly stuck to the walls so as not to distort the perfect circular shape. Water is splashed against the wall until steam appears; Lepyoshkas are baked with steam, radiated heat from the coals and the convected heat inside the hot-red walls of the tandir. 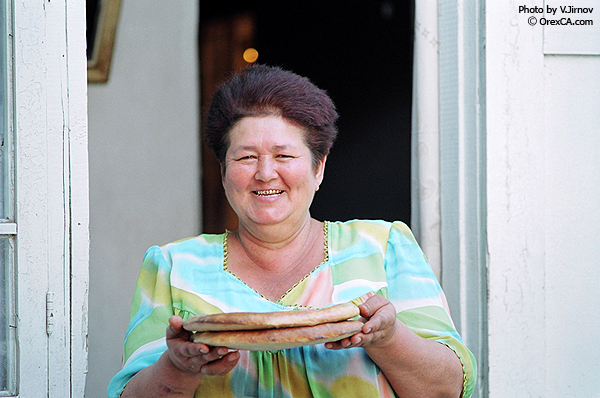 The appearance of a crunchy crust means that the lepyoshkas are baked through and through. Each loaf is removed with the special scoop. Lepyoshkas baked in the tandir have a full aroma, delicious taste, and a high caloric content, and are said to hold healing powers. "One having eaten in the morning a slice of lepyoshka with raisins, fried peas or Circassian walnut will not be thinking about food for a long time", goes a quote from Ibn-Sina (Avicenna). To express their great respect for bread as a symbol of family happiness, Uzbek door to door bread vendors since ancient times have carried bread baskets on their heads. 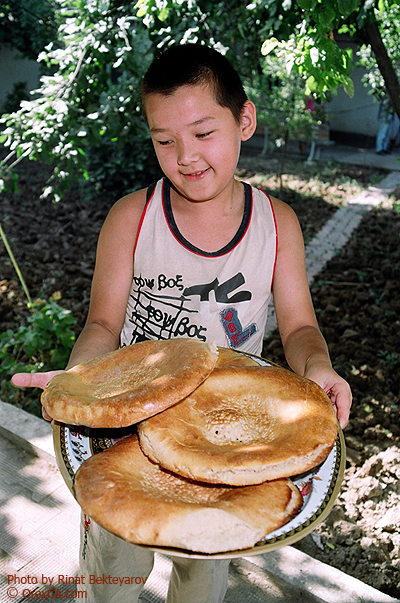 In different areas of Uzbekistan, lepyoshkas are baked in different ways, In Samarkand, small thick lepyoshkas, called shirma nan, are the most popular variety. According to ancient legends, one Emir from Bukhara had through hear say come to know of the fabulous taste of Samarkand lepyoshkas. He ordered his people to bring to the palace the best lepyoshka-baker. A Samarkand master bought flour, firewood and even water from one of the nearby villages and prepared the desired loaves. The lepyoshkas found everyone's approval, but when a connoisseur of Eastern cuisine tasted them, he announced "they are different", and the bread master knew his final hour had come. The Emir, much intrigued, asked him what he had to say in his defense. The old baker smiled and answered: "There is no Samarkand air around here." The Emir appreciated the clever answer and set the master free. There may be a kernel of truth in what the old bread master said, as scientific research has shown that the harder the dough is kneaded, to enrich it with oxygen, the lighter the bread ultimately becomes. Bukhara lepuoshkas, sprinkled with sesame or Nigella, exude a delicate aroma. This bread amazes you with its unique taste and healing power. Sesame causes the satiety and Nigella on the contrary whets the appetite. 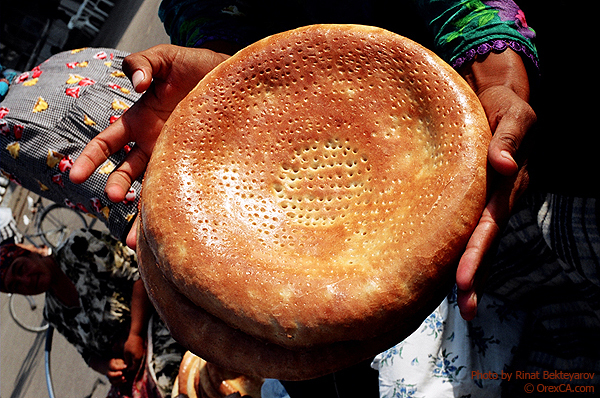 Wedding patir (flaky lepyoshka) from Andijan and Kashkadariya, According to ancient traditions this aromatic bread prepared with cream and butter was served during matchmaker meetings. Tashkent lochira, plate-formed lepyoshka, is baked from short pastry (milk, butter and sugar). Jirish nan is specially prepared bread made from flour mixed with bran; It is to this day used as a remedy for diabetes mellitus. Nomadic tribes didn't make tandirs because of their lifestyle. They cooked bread on butter in kazans (cauldrons), preparing the dough on a milk base. Particularly in the mountainous areas of Jizzak, kazan-patir is routinely enjoyed.